Situated in the Indian Ocean off the south east African continent, in 2015 Mauritius was the home for an ITTF World Junior Circuit tournament followed by the African Junior and Cadet Championships. It would appear that the event has had a most positive effect; the island is looking forward to competing in the forthcoming 2017 ITTF-African Junior and Cadet Championships to be staged from Sunday 9th to Saturday 15th April in Tunis. Rajessen Desscann former player and national coach, is most optimistic; he is looking ahead to the visit to Tunisia with great anticipation. Table tennis now in Mauritius is more popular than before with many young players. We are also planning to organise more competitions in future. 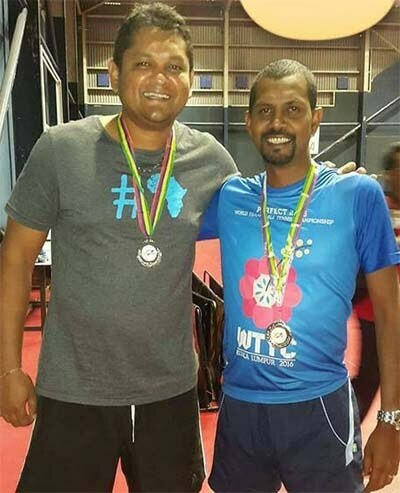 After the organisation of major junior tournaments in 2015, the government has increased the budget for table tennis as the sport is now being played everywhere in the island. Nigeria and Egypt are no doubt very strong teams and they are very difficult to beat. However, with the victory over Nigeria at the 2014 Youth African Games in Botswana and the Boys’ Team eventually winning silver, I think we have confidence to face any of these teams in any major competition. Our aim in Tunis is to make the podium in one of the team events. We will be in Tunis with a strong team. Nigeria, Egypt, Tunisia and Algeria are very strong teams but we will do our best against these teams. We hope we can pick one of the slots for the Youth Olympic Games but we know it is going to be very difficult. I have been Mauritius National Team coach for the last 10 years and I am very pleased with our results in the last few years. We will try to do more and get some good result; that is why we have been working hard as a team to achieve this in the next few years.